Experts in applied foot and ankle biomechanics! Considered the finest custom shoe facility in the country for people with foot and gait problems! Please click on video for a 3-minute overview! We listen to your frustrations about foot comfort, mobility, and meeting lifestyle needs, then offer personalized solutions based on affordability. As pedorthists, we know feet, and we know footwear. We also know that formulaic solutions don’t work for everybody. At our comfortable facility, we offer creative solutions to chronic foot and footwear-related problems ranging from inexpensive shoe modifications or inserts to designing custom-made shoes and boots from scratch. No other Pedorthic facility in the Bay Area has more experience or tools available to solve complicated foot and gait problems than we do. We work by appointments to assure you of personal attention and privacy. Although people are most often referred by a physician, many come to us through word-of-mouth or by finding us on the Internet. If you are under the care of a physician for your problem, it is beneficial to get a prescription so we can contact your doctor and include his/her input to your treatment plan. For third-party payment, a doctor’s prescription is mandatory. 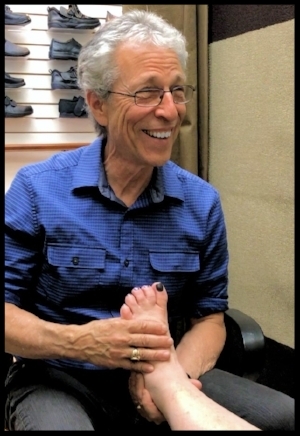 Prior to founding his business in 1977, Arnie Davis was the director of the Shoe Clinic at the California College of Podiatric Medicine and has been a faculty member in the Department of Biomechanics at the California Podiatry School at Samuel Merritt College in Oakland. After a formal education in art and sculpture at California State University Northridge and the Otis Art Institute in Los Angeles, Mr. Davis apprenticed in custom shoemaking with a Hungarian Master Shoemaker in Pasadena. With his knowledge of shoemaking and his inherent understanding of body balance, he came to the California College of Podiatric Medicine in 1975 to learn foot biomechanics from the leading experts in the field in order to integrate this emerging science into the antiquated and dying craft of custom shoemaking. He became a Certified Pedorthist in 1981, and as a result of this ongoing professional and academic relationship with the Podiatry College, also became an educator and leader in the field of pedorthics, serving on the board of directors and executive board of the Pedorthic Footwear Association. Mr. Davis is the author of A Guide to Custom Shoe Therapy and of two chapters in the textbook Introduction to Pedorthics. He has chaired 2 national symposiums and lectured nationally at seminars for Podiatry, Pedorthics, Orthopedic Surgery, and Orthotics / Prosthetics, and in 2010 was invited to speak at an orthopedic conference in Beijing China. He served as an expert witness in several lawsuits and as a consultant on government funded shoe research projects for the VA, for the Research Triangle Institute, and for the University of North Carolina. For a more personal story, see the article published in the San Francisco Chronicle in January, 2011. Although the team has changed and evolved over the past 4 decades, one thing has stayed the same — our exceptionally high standards that were established by Arnie Davis at the beginning and remain our driving force today. We at Davis Foot Comfort Center understand that people have concerns about cost versus value. That’s why we suggest a consultation with one of our pedorthists to listen to your needs and walk you through your options. Use the form below to contact us regarding your therapeutic needs. Please be as detailed as possible. To help us best service your enquiry, we recommend that you describe the issue you’re having and tell us what you want to achieve. You may also email or call us to make an appointment. Please let us know what your specific needs are.